To try Ian's Tarte Tatin with fresh ginger, click here for the recipe. 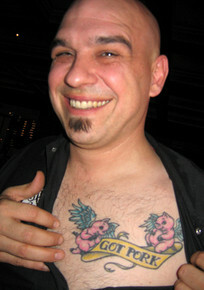 Now that chefs are the culinary equivalent of rock stars, many have the requisite tattoos to match the status. Michael Symon's punctuation-less "Got Pork" is not my style. But Hugh Acheson's radish is nice. 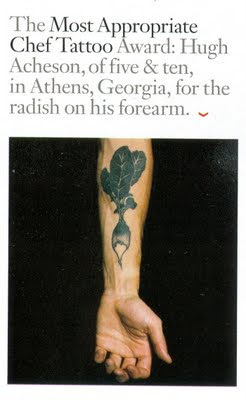 And my all-time favorite chef tattoo (sort of a tattoo—scarification, actually) is Gabrielle Hamilton's. She has an asparagus spear carved into her upper arm. It's pretty badass. I don't have any tattoos. I prefer more traditional kitchen markings like scars and burns. I got a new one, a good one, last week, and I've been showing it off since. Of course, the kitchen is full of things that might cut or burn you, but this branding comes from the famous (and dangerous) kitchen tattoo/scarification artist called Caramel, which, if at the correct stage, is around 340 F. It happened when I flipped an upside-down apple tart right side up. A tablespoon of liquefied burnt sugar landed on and oozed down my forearm, burning all the way, like a lava flow. It was all I could do not to drop the dessert. If you eat dinner at my table any time between October and early March, there's a good chance your dessert will be my version of a tarte Tatin. It is by and large one of my favorite desserts to make and eat. It's simple, flavorful, and really lets those apples take top billing. And I have an affinity for apples. There are two ancient apple trees that grow on my family farm in Pennsylvania. One is something like a Golden Delicious, which is the traditional apple used in the French dessert. The other tree's fruit, however, is similar to a McIntosh but tart like a Granny Smith, and has the flavor I prefer in my apple desserts. Of course, there aren't enough Knauer farm apples for you to use, too, but the closest commercially available variety is Winesap. If you can't find those, use Gala. Most importantly, unless you're addicted to pain (or want desperately to be one of the cool kids), please, take care when flipping over the skillet. Ian Knauer is a former Gourmet test kitchen cook, and he wrote extensively for Gourmet and Gourmet.com until the close of the brand in late 2009.